I worked an abbreviated day yesterday, after ten hours of sleep, then came straight home and took a nap. I've turned into a tremendous wuss. I used to routinely get to work at 6:00 AM and leave around 11:00PM, six and sometimes seven days a week. Now I have a few 10-12 hour days in a row and I need recovery time. I decided that I need the great monks of Belgium to satisfy my beer craving after a busy week. This task could not be left to the bearded hipsters of America microbreweries. I needed to call upon the bearded monk hipsters of Belgian breweries. 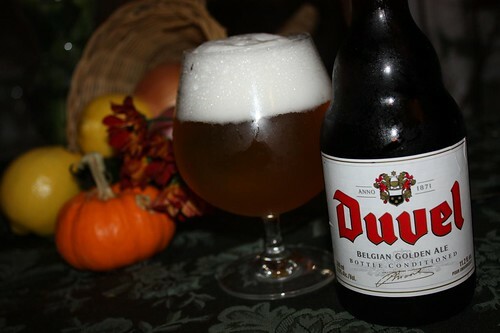 I started with a Duvel, saving the big guns for tonight. 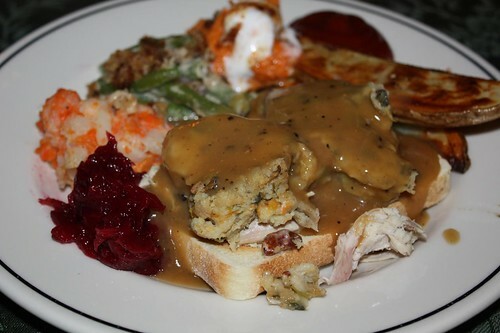 Friday we, once again, had our two interpretations of hot turkey sandwiches. Jen was sad about the sherry gravy she made so she thawed out the rest of the gravy and made a thicker version with no sherry for our sandwiches. 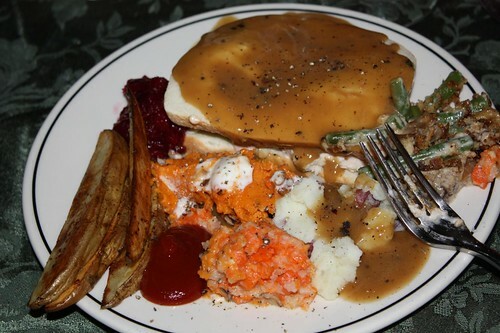 This particular leftover dinner is probably no longer worth mentioning as we make it twice a year for Canadian and American Thanksgiving but for completion's sake I show it here. 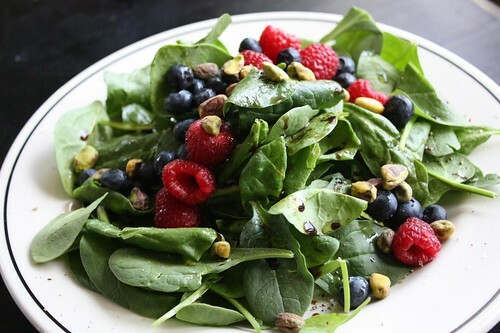 For lunch today we started out with something a little lighter by combining the leftover fruit salad ingredients with some spinach, pistachios, balsamic vinegar, olive oil, salt, and pepper. This probably would have been more virtuous had we not still been hungry after the salad and heated up two full plates of Thanksgiving leftovers slathered with gravy. 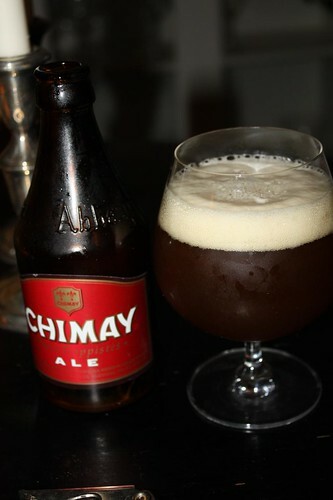 Tonight I let the Belgians take care of me once again, this time with what has long been one of my favorite beers, Chimay. Maille. 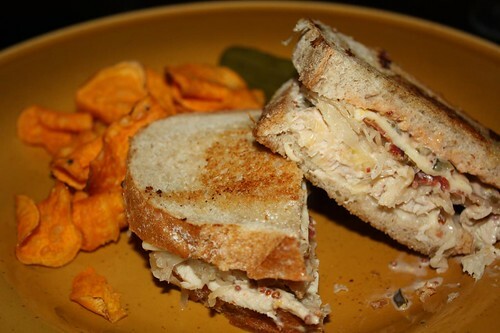 I then topped it with some hot sauerkraut, more Swiss cheese, more sauce, and another buttered slice of rye bread. This may rank up in the top ten best sandwiches I've ever had. Unfortunately the sandwich experience was somewhat co-opted by the mustard. Well, not the mustard itself but the odd promotion on the mustard itself. You see, the mustard seems to be promoting that romantic comedy with Meryl Streep and Alec Baldwin. Printed on it is: "Own it on Blu-ray and DVD 4/27!" So, apparently, this has been in my cupboard for some time. It also advertises "Summer Recipes Inside" and the self-deprecating "le yum." 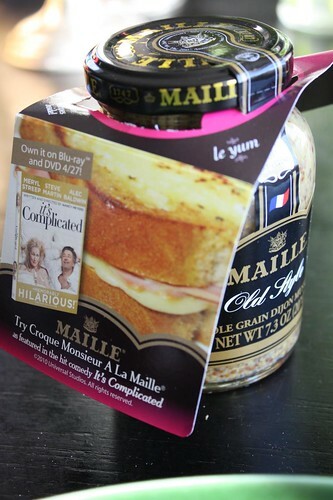 Attached is a little booklet with a few different recipes including Croque Monsieur A La Maille as featured in the hit comedy It's Complicated. This just seems like the strangest cross-promotional marketing campaign I've ever witnessed. You may note that the URL above has no link to the actual website. That is not only because I simply copied and pasted it from their website. If you go to their odd mustard/DVD partnership website you will note that this is true on their site as well. They pasted the text with the URL and did not make it a link. So, in order to visit the movie's website if you are interested you will have to copy and paste the URL text into your browser's address bar and go there that way. Going to that site you will see that they fulfilled their end of the cross-promotion with a bit more competence. They provide a graphical link to the Maille website. It seems like Maille got the better of this marketing deal. 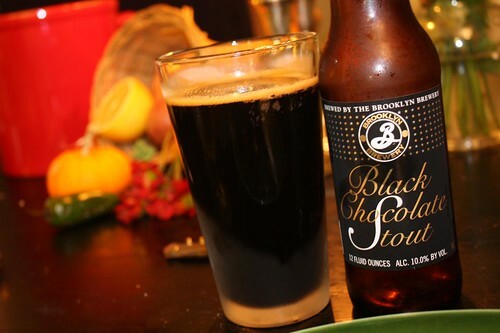 To try to take my mind off the odd Maille/DVD issue I enjoyed a post-dinner Black Chocolate Stout from Brooklyn Brewery. I've been putting this one off for a while because I'm not a big fan of stouts and it is 10% alcohol. However, after turning this whole mustard/DVD thing over and over I needed something to take my mind off of it. Even in a James Bond movie I couldn't imagine product placement of mustard. I can't figure out how this mustard thing happened. Is there product placement in the movie? At first I thought that perhaps the people at Maille and Universal had joined forces to launch the world's worst marketing campaign. Now I'm convinced that they are geniuses. See, I've been a Maille customer for years now but the movie It's Complicated came and went without me paying any attention to it at all. Now I actually feel compelled to see the movie and see what's going on with this Croque Monsieur scene. Now I think I'm going to have to order the DVD and find out. And maybe I'll make some Croque Monsieurs for us to eat while we watch it, using Maille mustard of course. 2 Belgian "beers" and a dessert "beer". Ye gads! 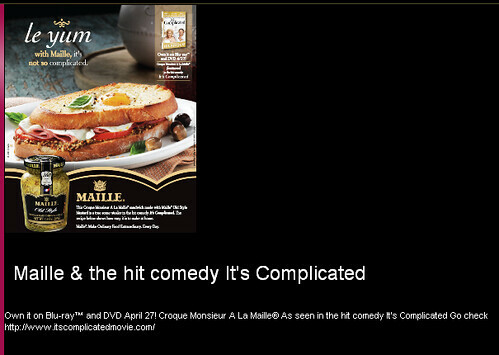 Oh man, I want to be there when you watch _It's Complicated_ and eat croque monsieurs. Having seen the movie, I suspect you'll be disappointed by the prevalence of croque monsieurs, but forget I said that! because I'm really looking forward to either witnessing or reading a rant about that movie.